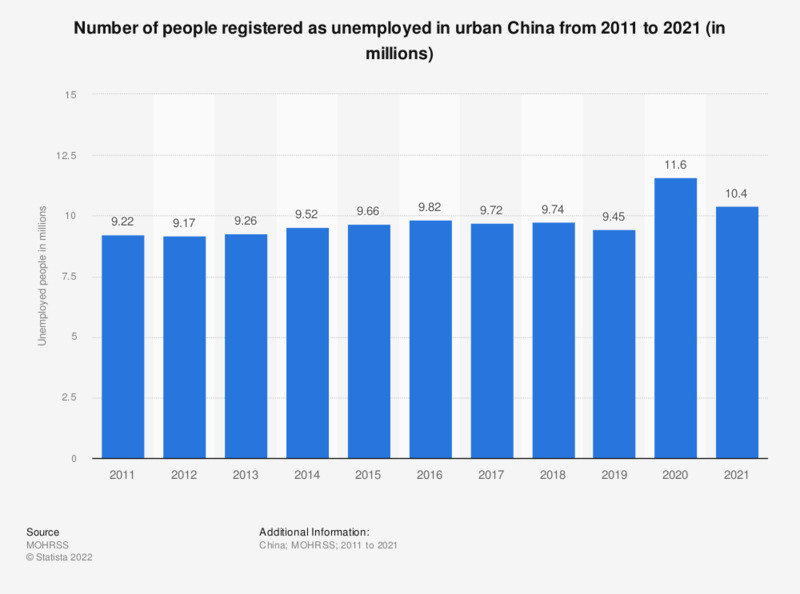 This statistic shows the number of unemployed people in urban China from 2007 to 2017. In 2017, approximately 9.7 million people in urban China had been unemployed. According to the graph at hand, absolute unemployment in China has gradually risen over the past decade. Although this increase suggests rising unemployment levels, a glance at the unemployment rate in China shows that national unemployment levels have remained stable at around four percent in recent years and even saw a slight decline from 4.3 percent to 4.1 percent in 2010, as the national labor force in China simultaneously had shown continuous growth. Nevertheless, due to the continuing demographic shift towards urban areas and coastal provinces as well as disadvantageous location factors, especially central and western regions in China face above average unemployment levels among their population. Among those regions, Hunan, Sichuan and Shandong displayed the highest number of unemployed people. As of 2013, Hunan ranked first with around half a million unemployed people. It is also worth nothing, that the structure of youth unemployment in China has its own character. Those who are less educated were far less likely to be unemployed than those who were better educated. As of 2011, approximately 16 percent of Bachelor graduates had been registered as unemployed, whereas merely four percent of young people primary school education or lower did not have a regular job. According to the source, the data refer to urban unemployment only.